Thoggen (http://www.thoggen.net/) is a simple, easy to use DVD extraction program for GNU/Linux, to create Theora videos. Note that only the video part of DVDs can be encoded; any menus present on the DVD are going to be stripped out. You will be asked for your password, and then Thoggen will be installed. You are asked to select the titles that are going to be extracted and converted to Theora. The longest title is selected by default, as this is usually the main video. If this is not what you actually want, change it to suit your needs. Note that you may also convert from a DVD image on your hard drive, instead of directly from a DVD. To do this select the image location from the 'File' menu. The same list of titles will then be displayed, as if it was taken directly from the physical DVD. When done selecting, press OK and you will be taken to the next dialog. When you are happy with the settings, press OK, to start the encoding. You are then presented with a slideshow preview of the video along with a progress bar, while waiting for the encoding process to finish. You can now use VLC, or any other player supporting Theora, to view your copy of the DVD, without having to actually search for and insert the DVD into the drive whenever you want to watch your movie. Thoggen can remove borders at the left, right, top and bottom when encoding the DVD, available from the Configure Cropping button. It is often actually a good idea to remove about 5% the movie's width and height. This is due to the fact that DVDs are manufactured with ancient analog televisions in mind, hence there are usually borders around the movie. Older DVDs sometimes contain noise and artifacts in the movie borders, only visible when playing the DVD on a PC. 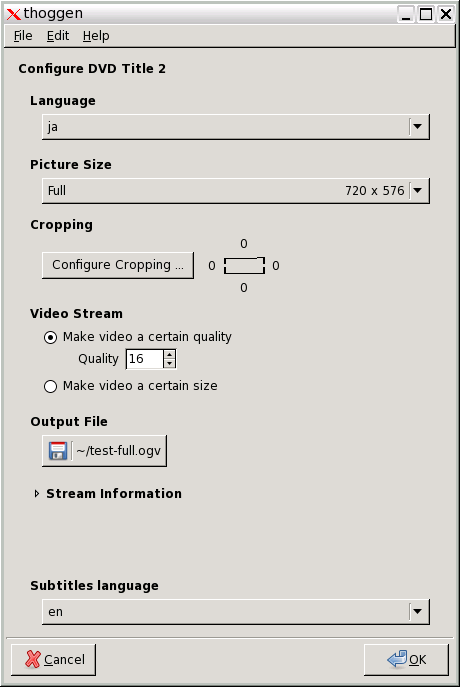 For a typical DVD resolution of 720x576 pixels, try cropping 8 pixels on the left, right, top and bottom, leaving a total frame size of 704x560.